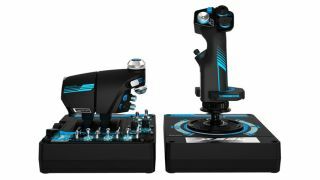 Logitech has just purchased Saitek, the company known for its seriously heavyweight flight (and space) sim controllers and accessories, for $13 million (around £10 million, AU$17 million). While Logitech already makes steering wheels for driving games, in a blog post, the company notes that it wants to expand into the wider simulation market. While sophisticated flight sticks and yokes/pedals – and even mock instrument panels – might be a niche market, these are generally expensive peripherals and ones that doubtless run with a comfortable profit margin. Plus it's likely that Logitech is looking to the future, as the firm also mentions the increasing amount of VR-enabled sims around these days. And going forward, fully-fledged and more realistic controllers could be a part of obtaining that complete virtual reality experience. Saitek's latest X-56 Rhino advanced flight controller (pictured) is already built with VR in mind, in terms of placing the buttons and using subtle nuances in their shape and feel, so the player can easily tell which one they're pressing when wearing a VR headset while enjoying some Elite: Dangerous. Logitech stated: "We care about this space and want to do right by its fans. We have a vision that will take these products further, faster. Stay tuned for future updates, as we further integrate the Saitek products into our overall Logitech G portfolio." Logitech purchased Saitek from MadCatz, which had previously acquired the sim controller specialist for $30 million (around £23 million, AU$40 million) back in 2007. Compared to $13 million (around £10 million, AU$17 million), that's quite a tumble in the value of the firm over the last decade. While Saitek is certainly a respected brand, in terms of more recent online feedback, there have been some rumblings and complaints – particularly with regard to the X-55, the predecessor to the current X-56 Rhino, which suffered from quality issues according to some who purchased the peripheral. Although according to the X-56 press release, that stick was "completely re-engineered from the ground up to address feedback received from the simulation community and incorporates new materials [and] increased switchgear life cycles." Let's hope that if Saitek peripherals have lost any traction of late, that Logitech will be able to get things back up to speed nicely.